Case Type Snapper DVD Extras: Behind-the-scenes documentaries, Filmmaker commentaries and creative personell interviews, Director's Video journal, An Intimate look inside the acting process of Ice Cube, Stills Gallery, Hidden Bunkers, Theatrical Trailer, TV spot, Production Notes. 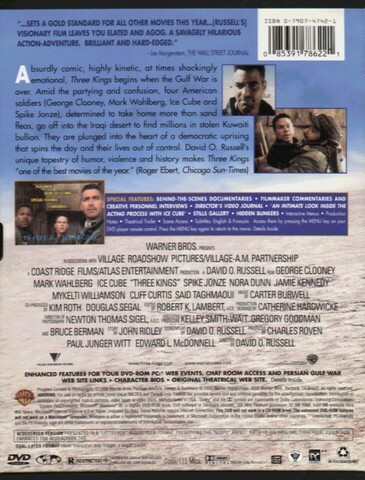 IMDB Rating 7.8 DVD-ROM PC Friendly, Web Site and more. This was a much better movie than i had thought upfront. I thought George Clooney? C`mon give me a break! and has audio and video near perfection. This is a must have DVD, I recommend it to every moviefans. 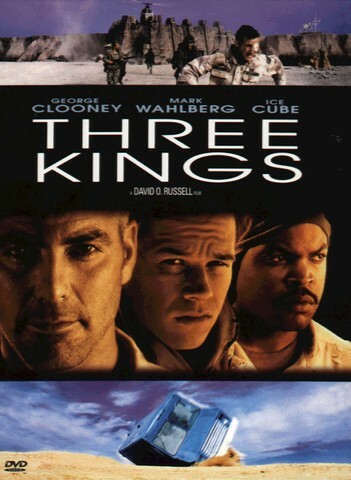 Three Kings gets a strong 5.